So, what did we learn from our navigation study? That even after more than a decade of trying to organize NASA’s website along lines that make sense to you, the public, we still do some things that make more sense to us. In trying to create a minimum of top-level nav categories, we grouped some things together in ways that confuse you. All of this has given us good input for this second round of tests. Colleen Kaiser, our user experience engineer, has created two versions of a new test. You’re welcome to try either or both. I won’t tip off the revisions we’ve made – go and see for yourself. Thanks again for helping us. Notice something different on the homepage? In a subtle switch, late yesterday we changed three of the topical buttons on the right side of the homepage to reflect NASA’s new path and new programs. As we said before, websites are organic creatures — growing, shrinking and constantly changing as the organizations they represent are themselves changing. NASA is moving forward on a new path, investing in the commercial space industry for access to low earth orbit, while developing a heavy-lift rocket and crew capsule to carry astronauts beyond Earth’s orbit. As a result, we added Commercial Space and Beyond Earth buttons to the homepage to reflect this transition of direction for the agency. We removed the Moon & Mars buttons as the content previously there was covered under these two new buttons or the existing Solar System button. We also combined NASA History and People into one button since there was often a lot of overlap between those two topical areas. Over the last two blog posts, we asked for feedback about the icon and label for what became the Beyond Earth button. We really appreciate all the feedback we received. It was truly helpful to hone our concepts down to the finished product. Following up on another blog post from the end of April, we also have some good news to report. 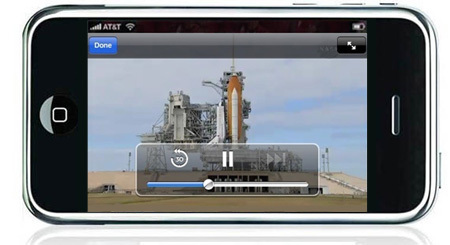 After launching NASA TV streaming to Android-based smartphones, we realized we had a compatibility issue with certain versions of the Android system. This produced a scrambled picture for the affected users and was widely reported in the comments. We worked for a few weeks on a fix and soft-launched a fix for the scrambled picture prior to the current Space Shuttle mission. While this may not solve our stream compatibility issue for every type of Android-based devices, we have been monitoring the blog comments, our hq-webcomments@nasa.gov e-mail account and feedback on NASA’s Twitter and Facebook. We think at this point the major scrambled picture issue has been resolved. We’ll continue to monitor it and troubleshoot compatibility issues as they arise. We hope it’s working significantly better for everyone out there than it was when we first loft-launch Android streaming of NASA TV. Check it out today by visiting http://mobile.nasa.gov on your Android smartphone and selecting the ‘Watch NASA TV Live’ link at the top of the page. What do you think? Did we miss the boat on these narrowed-down choicesor are we still headed in the right direction? Do you prefer one overthe other? Let us know. Leave us a comment on this blog post or e-mail us at hq-webcomments@nasa.gov.We thank you for this valuable feedback. It’s been extremely helpfulfor the web team as we move forward with NASA’s new programs. Websites are often organic creatures — growing, shrinking and constantly changing as the organizations they represent are themselves changing. NASA is moving forward on a new path, investing in the commercial space industry for access to low earth orbit, while developing a heavy-lift rocket and crew capsule to carry astronauts beyond Earth’s orbit. 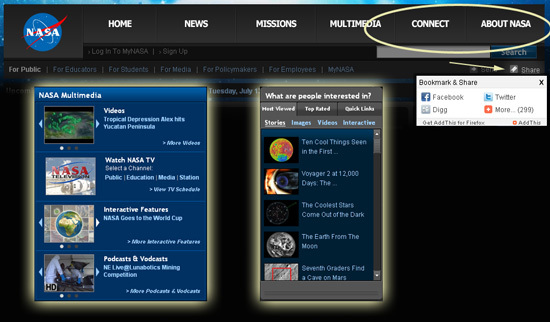 As we transition from some mostly-discontinued programs to new programs, one of the most prominent changes will be the button links at the top right of www.nasa.gov. These buttons are our way of getting users quickly to the latest news and features in our key topic areas. We’re searching for the best way to represent the agency’s future plans for human space exploration, and we’d like your feedback. Below are four icon concepts, along with several labels. Which do you think captures the spirit of the forthcoming new missions and projects? Are there other options for icons and labels we haven’t thought of? Do you like elements of one but not another? Let us know. Leave us a comment here on this blog or e-mail us at hq-webcomments@nasa.gov. Reflecting these sorts of changes online can be challenging. We’re often constrained for physical space in the templates and are usually having to create artwork to represent concepts that are only in the earliest of planning stages. This feedback will be incorporated into our transition plans totransition to create sections on the site for these new programs. And by the way … this is not the forum for a debate on which direction NASA should be taking. Please keep your comments focused on the icons and labels themselves. This way you are helping us to make the site work better for you. In many ways, last week was an experiment for us. Like most sites, we collect user feedback about our pages, the designs, the content and more. 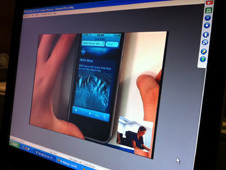 And we have always incorporated user testing into our design process. It’s really an integral part of the process. However, last week was the first time we officially collected feedback via social media. User Satisfaction Surveys – Using ForeSee Results, which you may have noticed on any number of sites, we gather feedback about how satisfied you are and benchmark it against other sites, such as Google and Amazon, using the same basic survey. The survey also has questions specific to NASA.gov. We review the results monthly and pay especially close attention to individual comments. Analytics – NASA analyzes web statistics — metrics such as page views, time on site and referrals — to show us what is popular across our site. We use these stats to see what people are most interested in and how they’re finding it, and this helps us make editorial decisions about where and how to highlight content on the site. This also includes items like the ratings for popular content or the number of likes/tweets stories have received, which can help users make informed decisions about their next clicks. 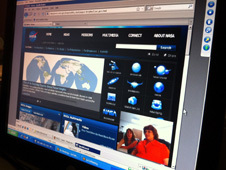 User Testing – NASA.gov conducts usability testing on most major changes to the website. This allows NASA.gov’s team to watch how users accomplish certain tasks and use the site in general. Which buttons and links do folks click on to get to this or that? Do they scroll the page missing the item we’d like for them to locate? Analyzing user behavior during these sessions helps us to make our designs smarter and more in-line with user expectations. But last week, our blog post was an experiment at a fourth way: using Twitter and Facebook to drive visitors to the blog post and soliciting their feedback. Thanks to all of you who responded. We’ve had a wide range of comments that will help us refine our designs, and we plan to implement these navigation menus within the coming months. We’ll blog about it again once the changes are live. We’re working on a new approach to our navigation menus and we want to hear what you think of them. The primary goal of the new menu design is to surface popular and hard-to-find contents so they are easier for you to get to. We’ve been listening to our users through a variety of channels including satisfaction surveys, e-mail and social media to learn what information you’re seeking on NASA.gov. Our new menus highlight this information, making it easier for you to get to, along with the standard sub-categories and links to featured and most popular content. The new menus can be found below. We really want to perfect these before launching them on our site so take a look at them and let us know what you think. And if you know of other Web sites that do navigation even better feel free to share them with us. Thanks in advance for your valuable input! Every day, hundreds of thousands visit the NASA web site seeking information about the agency, our missions and programs, and we’ve been getting feedback that they’re liking what they’re seeing. 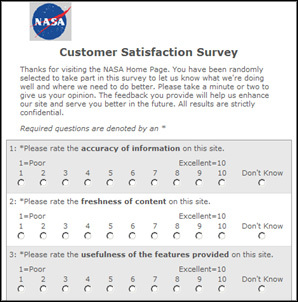 Recently NASA.gov received the highest customer-satisfaction rating of any government web site. NASA.gov also was included in a map of the most far-reaching web sites. And just today we received the statuette representing our third Webby award. That’s gratifying of course, but what does it mean besides a chance to blow our own horn? Mainly it’s validation that what we do here works for you, the Web public. We take your feedback seriously and rigorously incorporate it into our efforts to improve the site. To find out what the site’s users think of it, and most importantly if they’re finding what they’re looking for, we get feedback through multiple sources: e-mail to the site, traffic statistics showing what content people are interested in, and a customer-satisfaction survey. We use this information to prototype new features, which we then test with representative users before releasing it. Our goal is to constantly improve our site and make it consistently one of the best on the Internet. The latest customer-satisfaction data says we’re headed in the right direction. Starting in 2001, we had a rating of 73. More recently we have rated a 79 in 2007, 80 in 2008, and 82 in 2009 and most recently as high as 84. In plain English, NASA’s web site is closer to industry leading websites like Google.com (an 86 in 2009) or Amazon.com (also an 86) in customer satisfaction ratings than it is to other web sites both inside the federal government (74) and in the private sector (72). With continual growth in daily visitors to our site, increasingly high ratings of customer satisfaction, and additional recognition of our efforts to communicate effectively online, we are proud to be ranked among the best websites on the Internet. Earlier this year, Google released what it considers the top 1,000 web sites in the world by website traffic and NASA made the list. And, on Aug. 25, NMap released a poster of favicons, or small icons used by your web browser to represent a website, scaled to size based upon Alexa traffic rankings. NASA again made this ranking and was within the top-third of the rankings of the top 3,000 sites online. 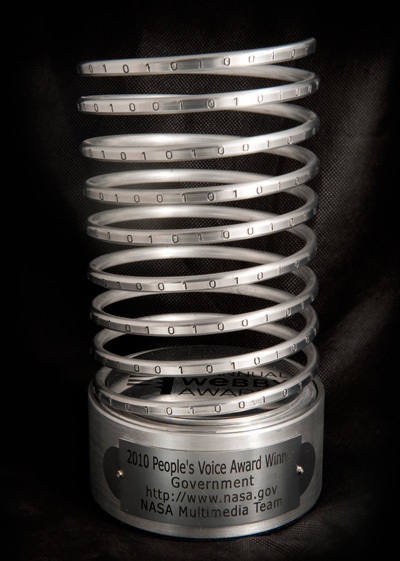 This year’s People’s Choice Webby Award in the Government category was our second in a row and third overall. Earning recognition as a Webby winner is a tremendous accomplishment, one we humbly accept. With nearly 10,000 entries from all 50 states and 60 countries around the world, the 14th Annual Webby awards was the largest competition in the award’s history. With all of these rankings, ratings and awards, we believe that the public is finding NASA.gov to be an authoritative source for the latest science, technology and mission-related news from the agency. We continually strive to improve and serve our site’s visitors in new and innovative ways. Our teams of web editors, multimedia producers and technical specialists meet at least weekly to discuss ways to enhance NASA’s online experience. With more than 50 staff located across the country and internationally, we are always on call and always posting the latest news from NASA. We are always listening to feedback, planning for the long term, analyzing what it will take to get the word out and rolling out enhancements to the NASA site. 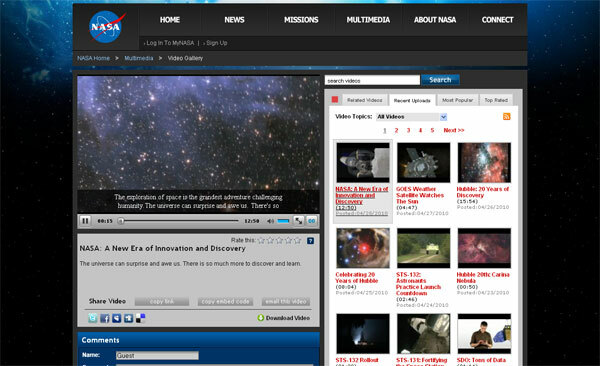 In the next few weeks, look for a new presentation of news stories on the home page, a revamped version of the mobile site and online streaming of NASA TV in HD. And remember your feedback is always welcome.